The University’s Quality Enhancement Plan (QEP) seeks to improve awareness of what it means to be a research university, align the missions of producing world class research and providing a world class undergraduate education, and promote opportunities for students to engage in research and scholarship. One such opportunity supported by the QEP is participation in Research-Related Skills (RRS) Courses. While many undergraduate students at Carolina engage in mentored research, the focus is typically limited to the research itself, and students do not gain the skills necessary to communicate their work to the scholarly community and broader society. The RRS course initiative will support courses that promote development of scholarly writing, critical scholarly literature review, and research presentation skills that are not part of the typical undergraduate research experience. RRS courses can be stand-alone courses or students in RRS courses can be enrolled in a research-intensive undergraduate research course (e.g. RELI/ANTH/PSYC 395) for a total of 3 credits and enroll in an additional 1-credit recitation section that will meet weekly in group settings similar to “journal club” or “research group” meetings. RRS courses could be organized around a specific area of research or more general in nature. A variety of assignments could be implemented, including in-class critical analyses of literature, writing abstracts, review articles or grant proposals, “chalk talks” about students’ own research, as well as other discipline-specific assignments. RRS courses should also include peer review and guided participation led by the instructor. One example of RRS type of stand-alone courses are the C.R.E.A.T.E. courses which you can learn about at this link. Proposals will be accepted from any department within the College of Arts & Sciences or the Professional Schools. 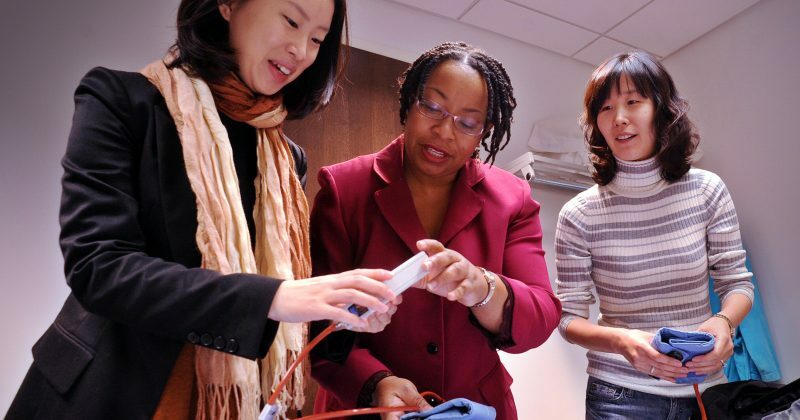 Course instructors may be faculty or postdoctoral fellows mentored by a faculty member. Departments with small numbers of undergraduate students involved in research may collaborate and offer joint RRS sections where appropriate. Similarly, departments, schools, or programs that do not have formal undergraduate research course offerings may collaborate with those that do where appropriate (e.g. Cell Biology in the School of Medicine and Biology in the College of Arts & Sciences), or may create a course via the Course Request Approval System. For more information on creating a formal undergraduate research course, please contact Nick Siedentop (nick_siedentop@unc.edu), Curriculum Director in the Office for Undergraduate Curricula. Awards will provide $3,000 in salary support for course instructors (i.e. overload for faculty or stipend support for postdoctoral fellows). Award recipients will take part in regularly scheduled FLC meetings. These meetings will allow faculty from all disciplines to share ideas, problems and solutions around the development and/or implementation of their RRS courses. The FLCs will meet monthly over a calendar year beginning in September. Recipients will also participate in faculty surveys and interviews, and facilitate documentation of student work and minimal student surveys regarding the courses efficacy. A description of the course including specific objectives, activities, and assignments. Relevant experience mentoring undergraduate researchers. Existing lab/department infrastructure or organization to support undergraduate research. 3. A signed letter from the department chair endorsing the course and the sustainability of the course (i.e. regular offerings). 4. Signed letter acknowledging the following responsibilities: “I will participate in a faculty learning community (FLC) that will meet monthly to share ideas, problems and solutions with colleagues and professional staff related to the development and implementation of RRS courses. I will be prepared for meetings, which may include having completed readings or preparing documents related to my course. I will participate in assessment activities, including: surveys/interviews/focus groups about my experience with the learning community; facilitating student surveys about their experience with the RRS course; and permitting student work to be evaluated by external reviewers. In addition, I am willing to share what I have learned with faculty in a future FLC or seminar.”. Proposals should be submitted by 5pm May 1st as a single pdf file via email to Boots Quimby, PhD, Associate Director of the Office for Undergraduate Research (bquimby@email.unc.edu).